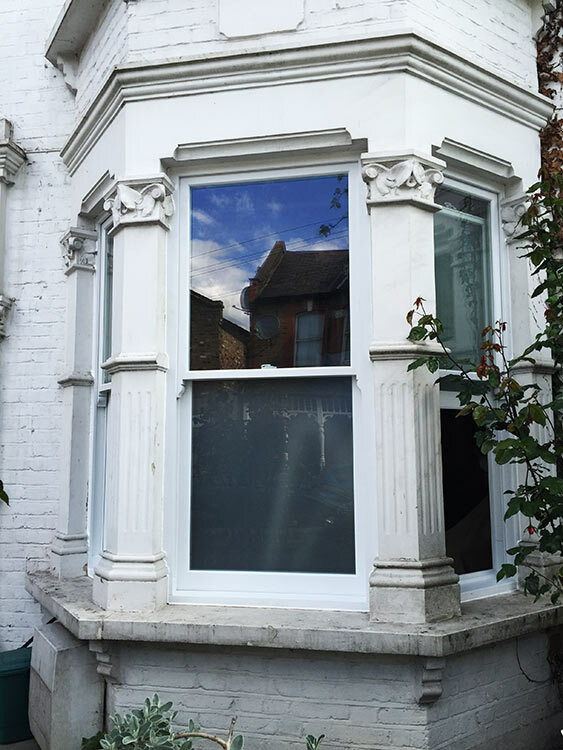 In our latest timber window installation in Leytonstone, North London our client wanted to get rid of all the old aluminium windows in his property and replace them with original-looking timber sash windows. 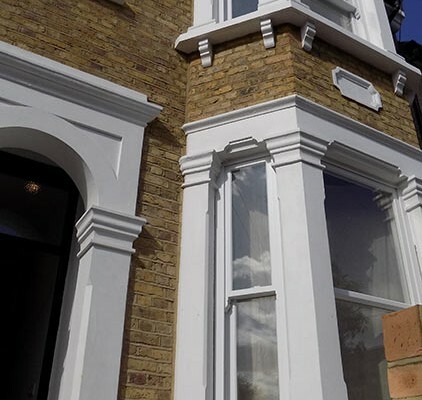 After being contacted through our website we arranged an initial sales meeting to meet the client and go through all the items required and the exact specifics for the project. 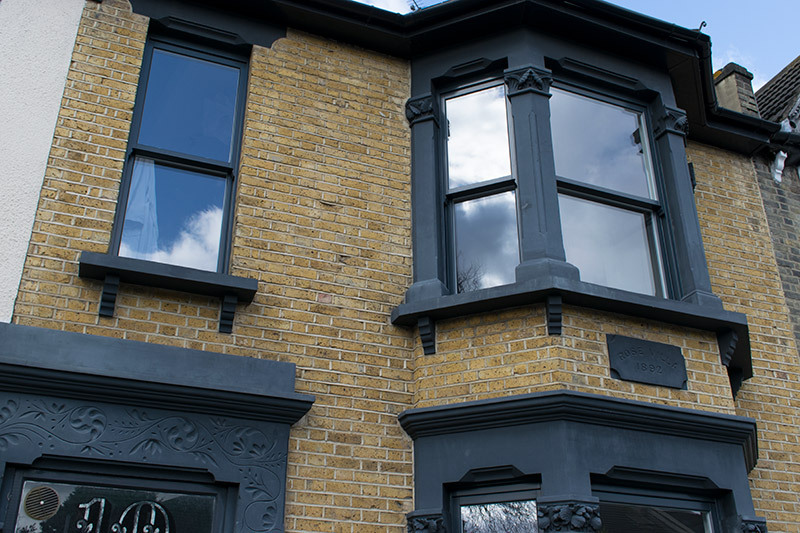 Our quotation was to replace all the windows with hardwood sliding sash windows, with the frames painted in two different colours – “RAL 7016 Anthracite Grey” on the outside and white on the inside. 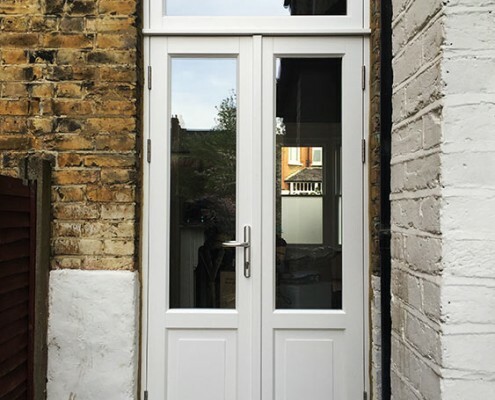 The sales meeting took no longer than 45 minutes, during which our helpful and experienced sales rep took all the necessary measurements to provide an accurate and detailed quotation. 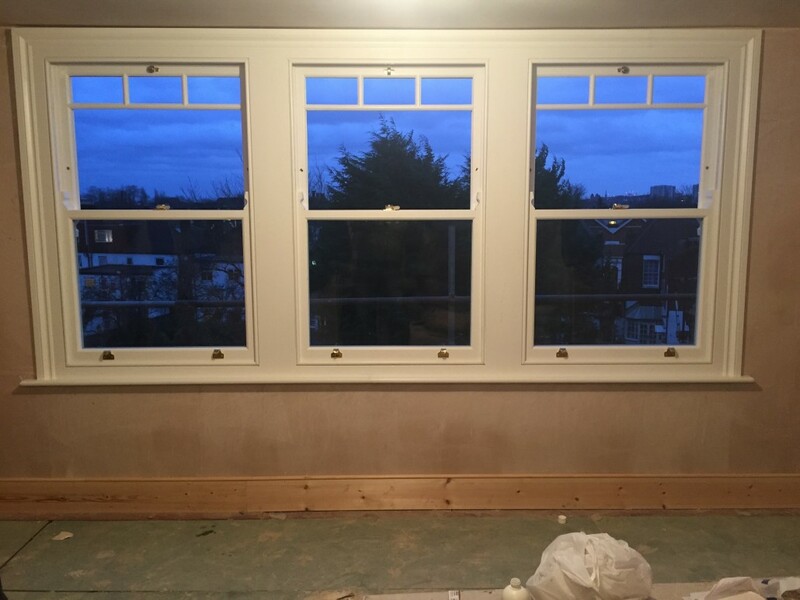 Within 24 hours the quotation was emailed over to the client, itemising each room with its specification and the cost to supply and install. 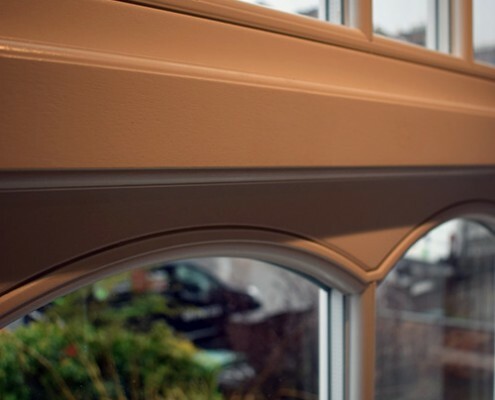 Our timber products are of the very highest quality and are manufactured using the latest in CNC machinery and temperature controlled spray booths to create a perfect build and multiple layers of micro-porous paint finish every time. 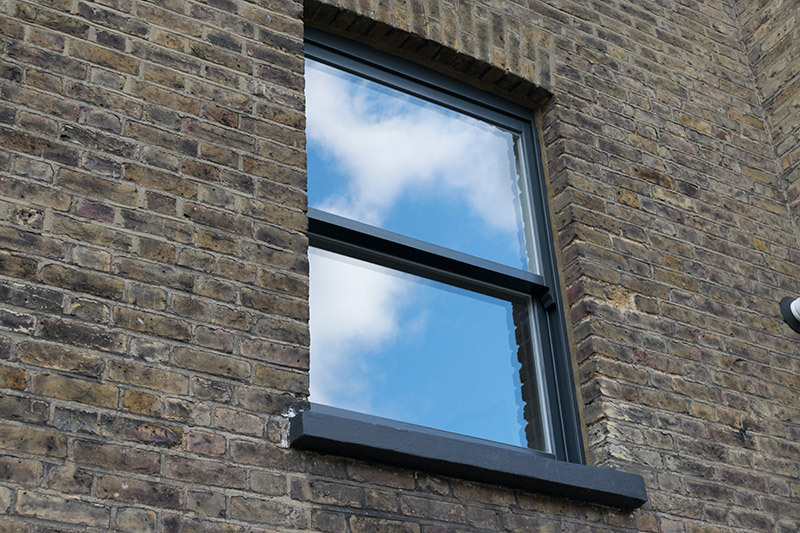 The glazing consists of a 4mm glass pane, 16mm warm edge spacer bar and a further 4mm glass pane, giving an overall thickness of 24mm. 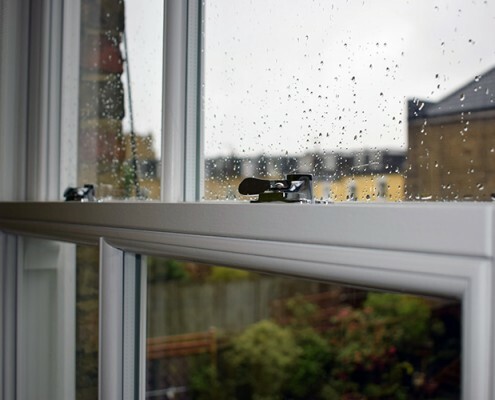 All our glazing is Argon filled, ensuring a low UV value of only 1.1. 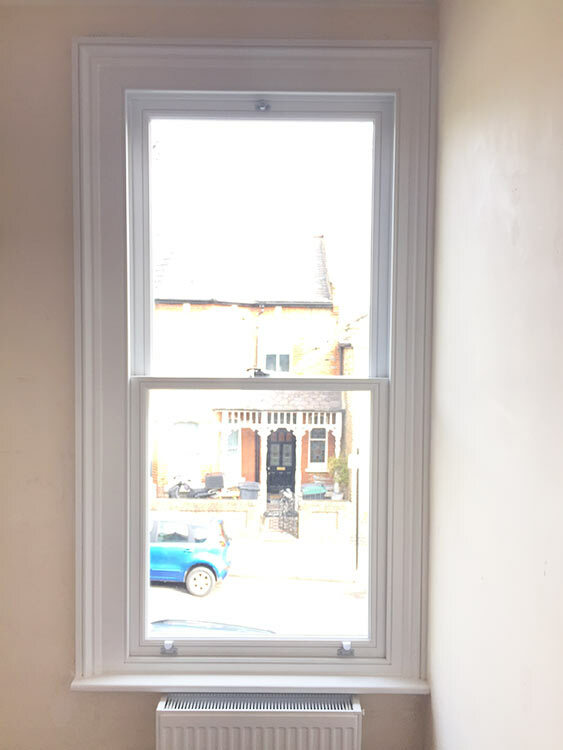 After the sales contract and final order details were confirmed, we carried out a full site survey and made a series of test holes in the existing frame to ensure that the dimensions were accurate and that the new windows would be in proportion and a snug fit. 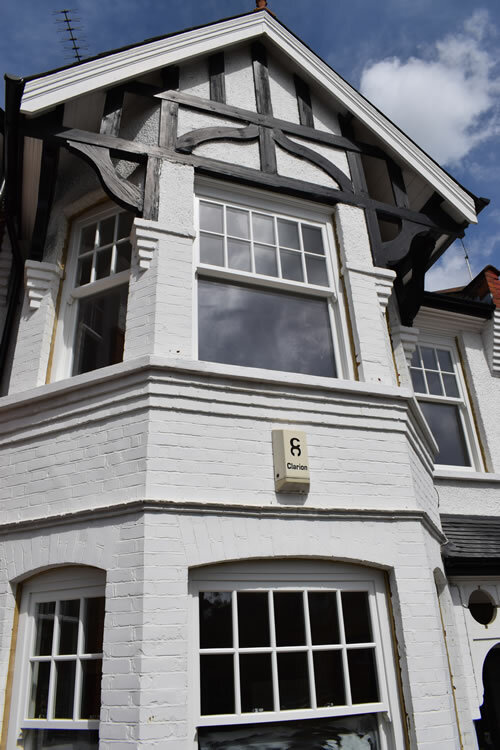 The lead time for all our timber windows and doors is six to eight weeks from our survey, although the dual colour requirements on this particular project stretched the lead time to 10 weeks. 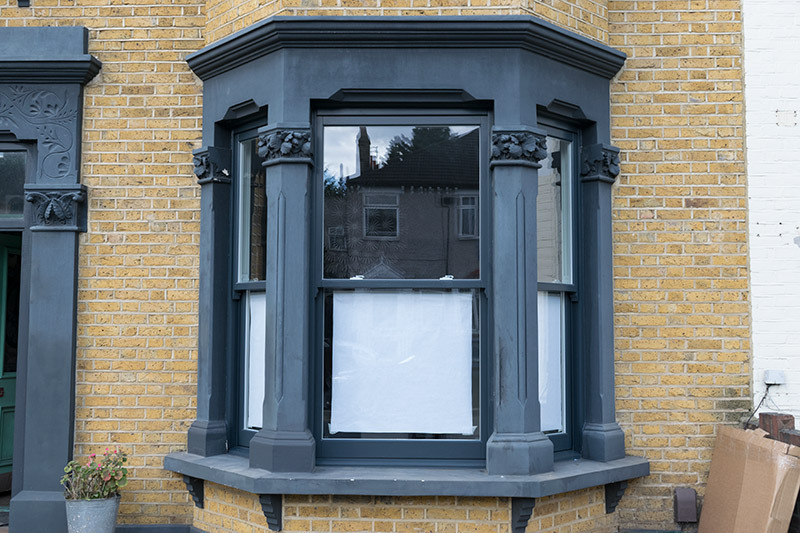 This was because each frame had to be meticulously taped during the paint process to produce a perfectly finished dual coloured window. 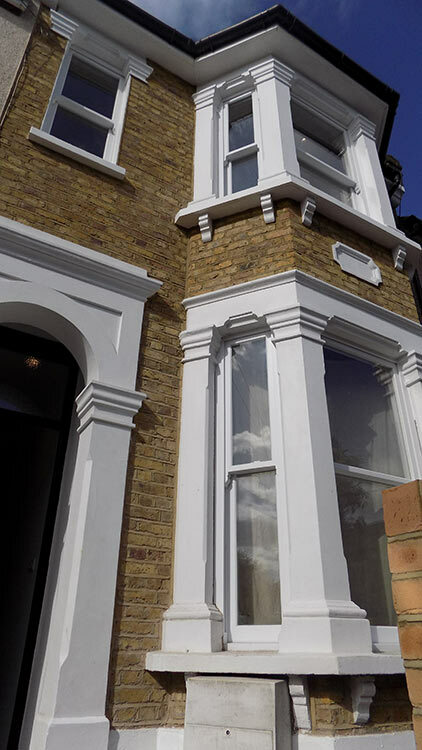 After six weeks we were notified of the confirmed delivery date then the installation was booked in, with a completion time of three to four days. 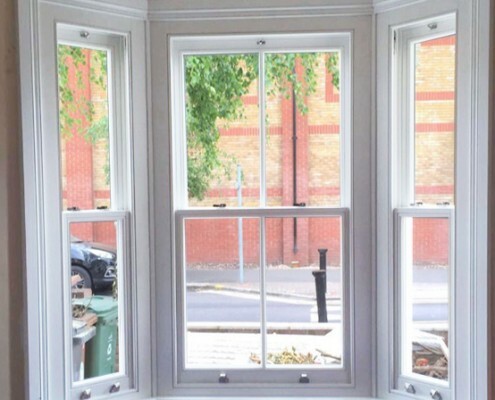 Our experienced fitting teams are highly skilled in the replacement of timber windows and doors and, as shown on all our blogs, the end result of a flawless installation is a superior finished product. 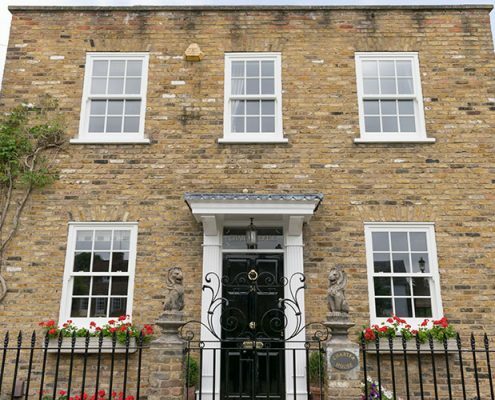 And it obviously did have the desired “kerb appeal” as we have since been instructed to replace old window frames with new timber sash at a neighbour’s house just down the road! 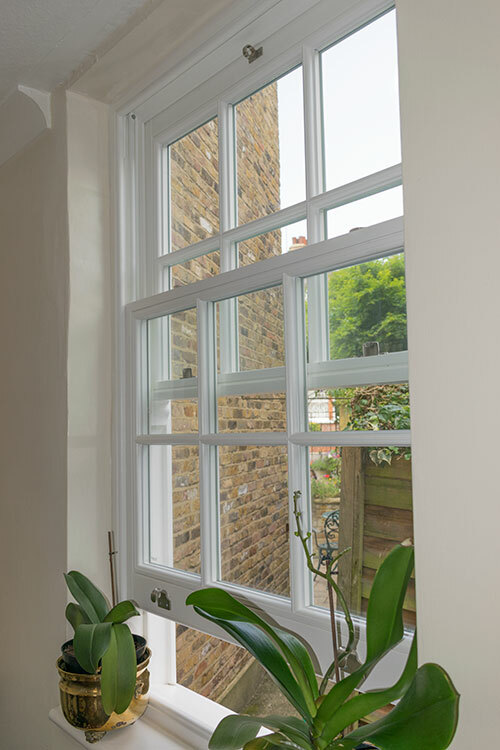 A recent sash window installation took part in a leafy road in the north London area. 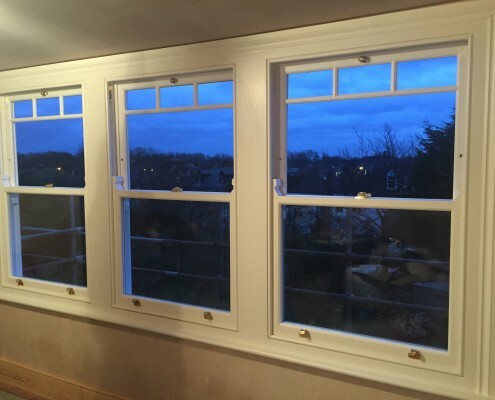 The client contacted us via our website after searching for replacement windows online. 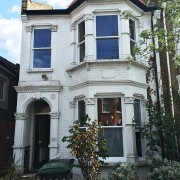 The entire property was under renovation, and new windows were required. 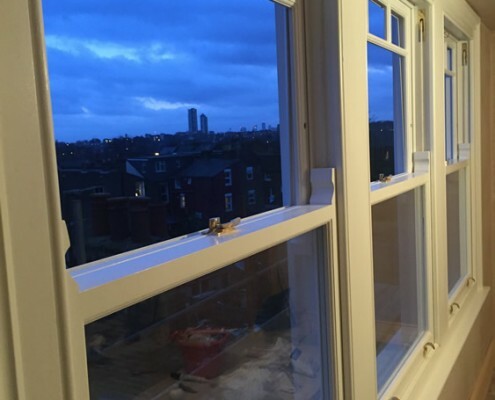 After their initial contact, our sales representative arranged a convenient time to visit the property to go through the clients requirements and which windows were in need of replacement. 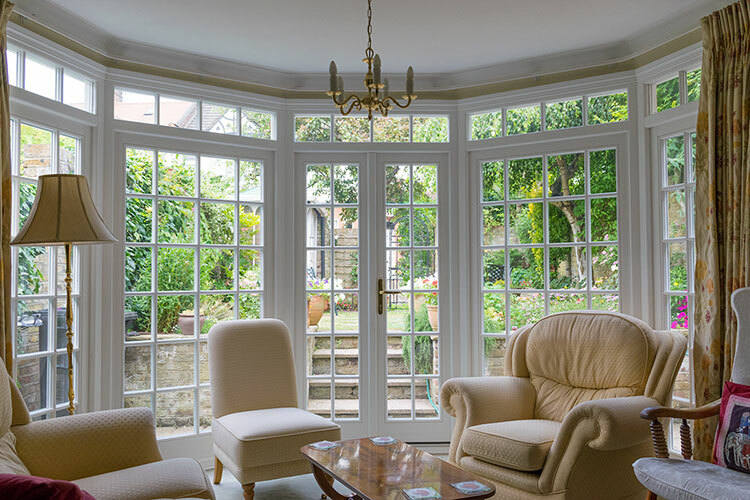 At Enfield Windows, our customer approach is one of complete non-pressure. 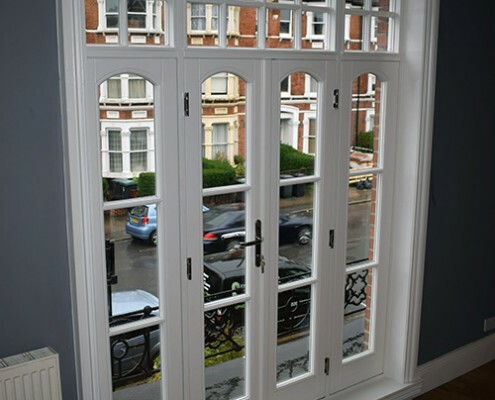 Our aim is to offer high-end products at affordable prices. 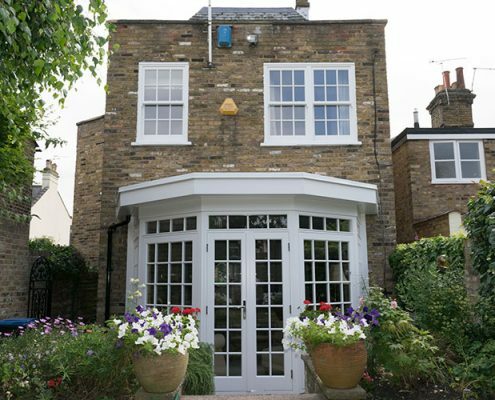 Due to age and characteristics of the address the client had decided on timber sash windows. 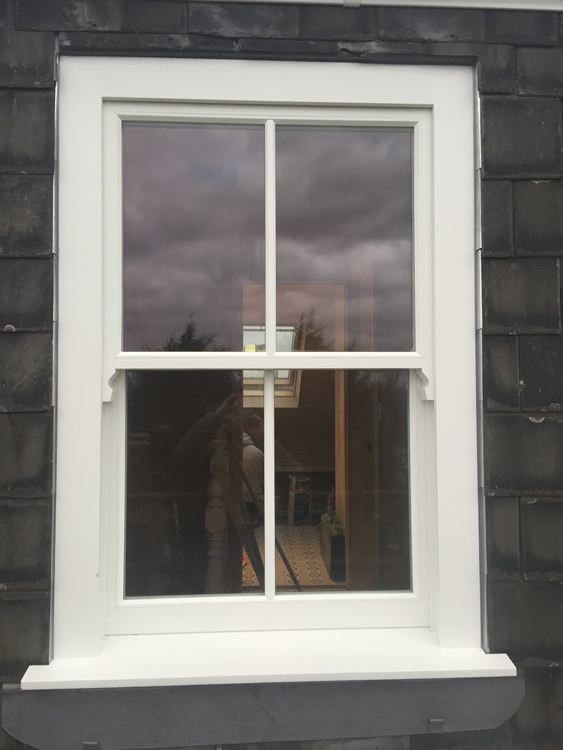 Our sales adviser went through our range of windows available, and the customer made a decision on what style they preferred. 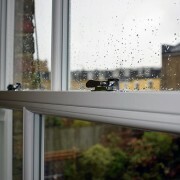 Within forty-eight hours we emailed them a full detailed quotation on all the products discussed. Many of our competitors choose to quote on the day, commonly by working from a price matrix. 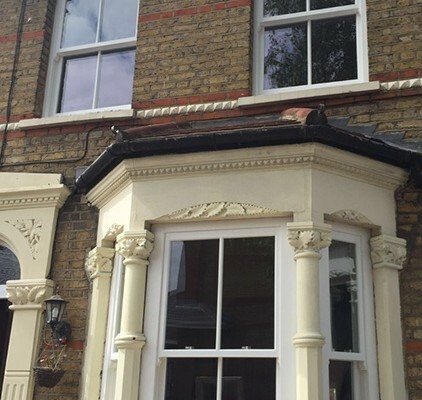 We choose to tailor the quotation and offer the client an accurate price via email. 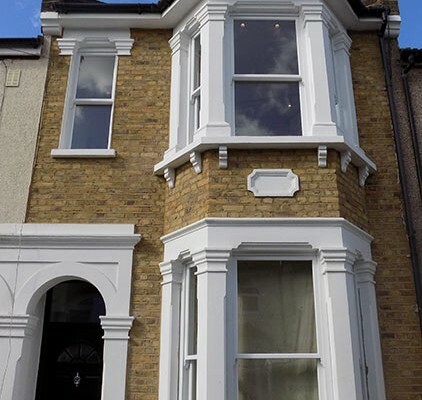 This way the client can contact us once they have compared the quote and they are happy and wish to proceed. At no point do we try to hard-sell any of our products. 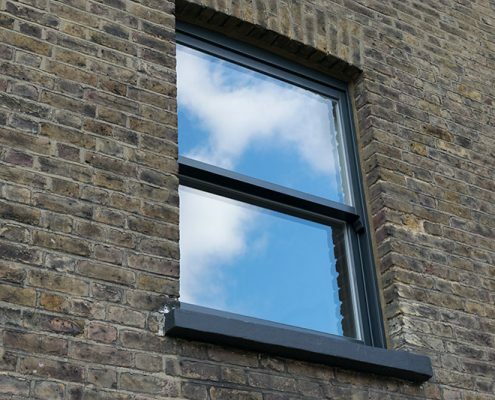 Our expertise within the industry, high-level installers, and quality products speak for themselves. 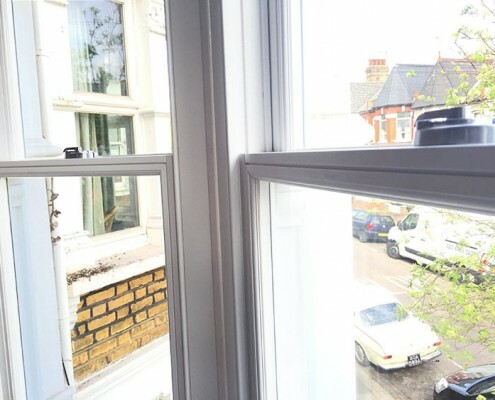 A short time later, the client contacted us again to arrange to showroom visit so they could physically see the products and get a feel for the operation of our beautiful timber sash windows. 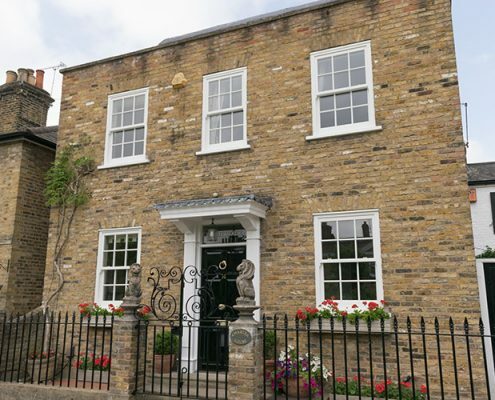 The price was agreed, and a contract was sent, specifying all the details we had discussed. Within days the order was fully surveyed and put into production. 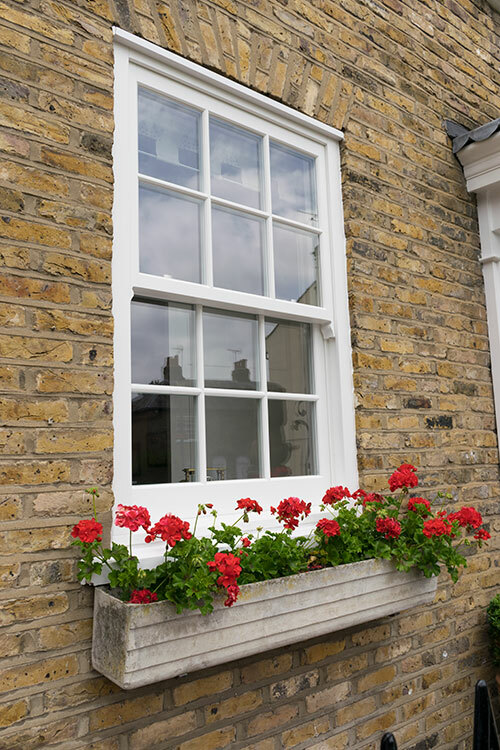 For timber sash windows our lead time is approximately six to eight weeks. 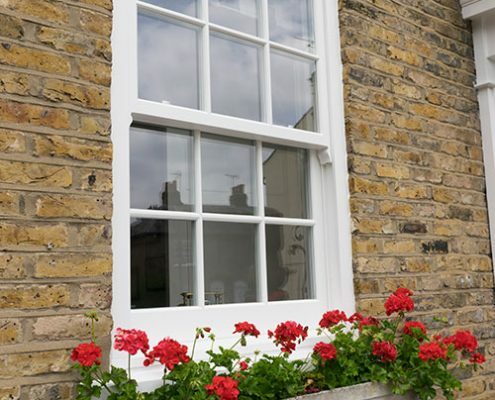 All our timber products are bespoke made and factory finished using microporous paints, ensuring each window has a flawless and protected finish. 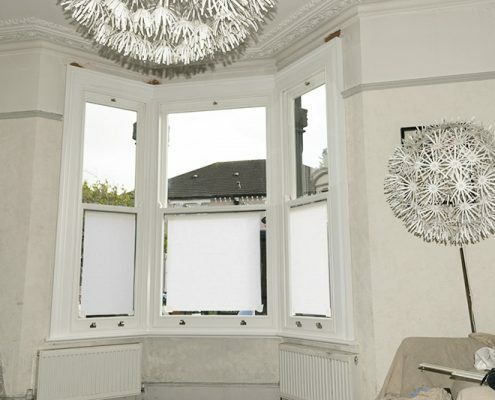 Midway through the manufacturing process, the installation was booked in with the client and scheduled to last three days. 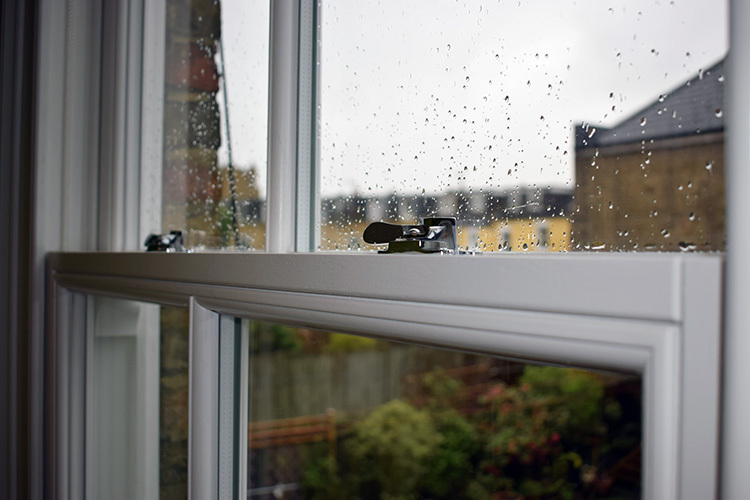 To ensure customer satisfaction, none of our full-time installers work on a schedule of rates scheme. 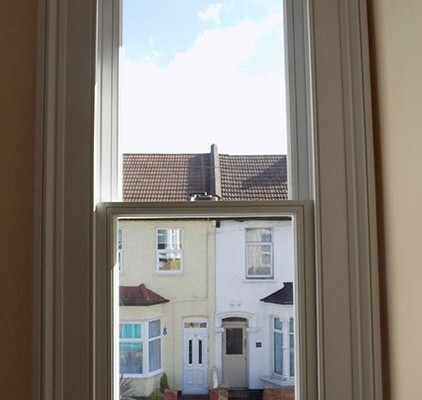 We believe each installation is unique, and this gives the fitters the time they need to carry out a first class installation. 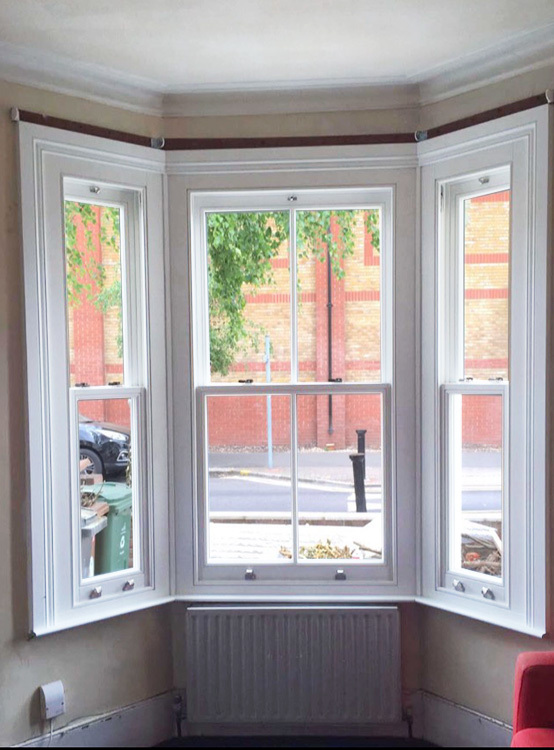 As the images clearly show this installation was a great success and the client was exceptionally pleased with the new sash windows. 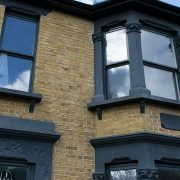 Since completion, Enfield Windows have taken two more orders from customers on the same road, which will follow shortly. 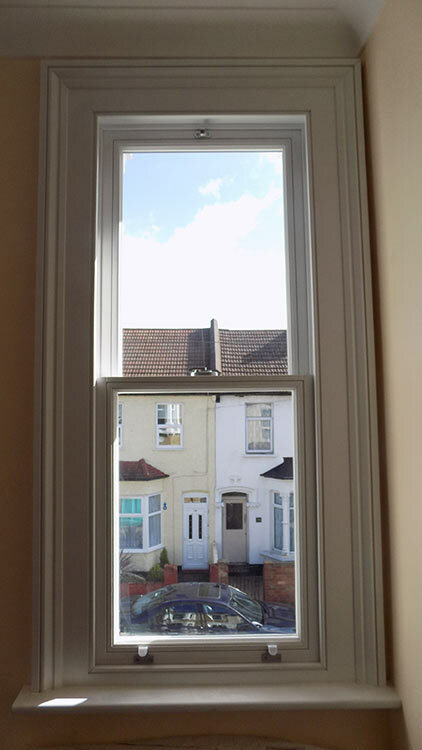 A recent installation took place in the Walthamstow area of north London. 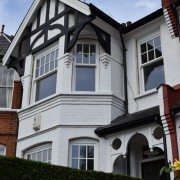 The client had recently moved property and was looking to replace the old uPvc windows that had taken away the character and charm of the Victorian property. 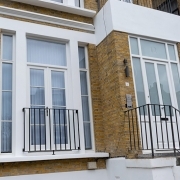 Contact was made via our website and a site visit from the sales team was arranged. 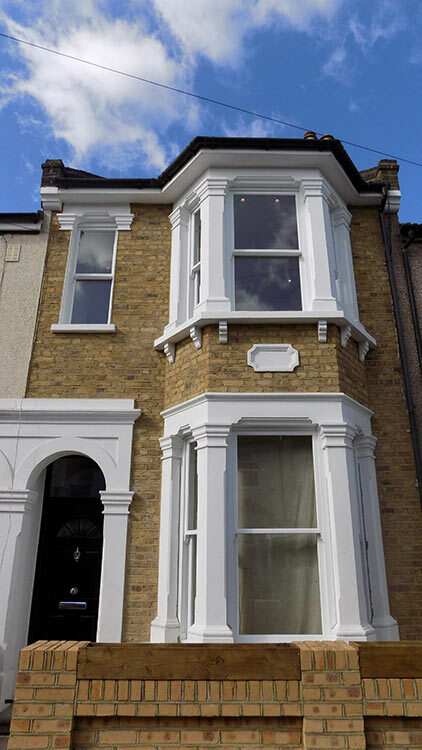 We carried out an approximate measurement of the windows the client was looking to replace which for now was the front aspect of the property. 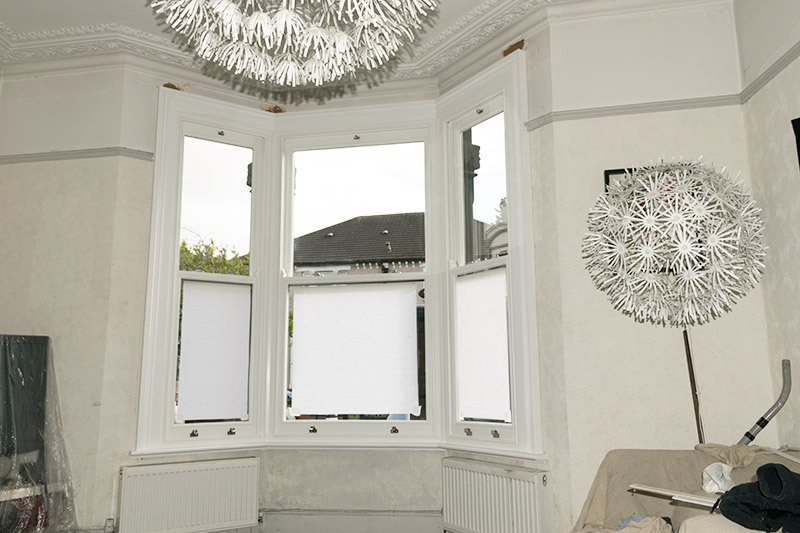 This consisted of two upstairs main bedroom windows and the lounge front three-part bay window. 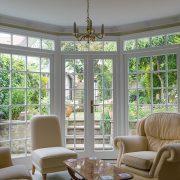 At Enfield Windows we choose not to visit potential clients home with the view to selling on the day. 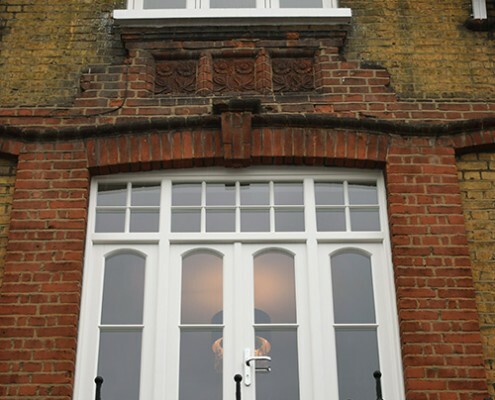 We would rather offer advice on all of our products and go through the installation service we provide. 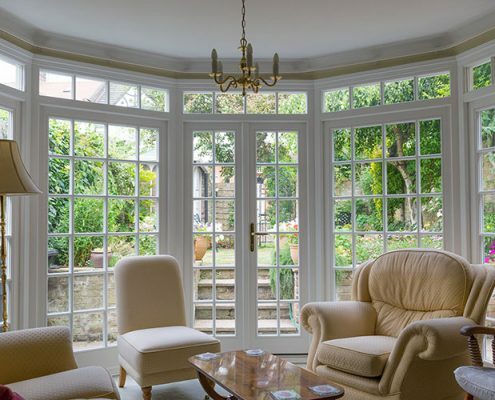 We also offer, literature leaving the client with no pressure when deciding on what can be a major purchase for any home depending on what is to be replaced. 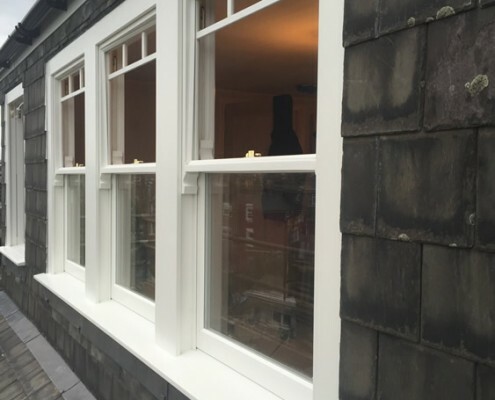 After explaining the process that our expertly made timber windows go through from production to being installed we then leave and offer the client a full proposal which is often sent via email. 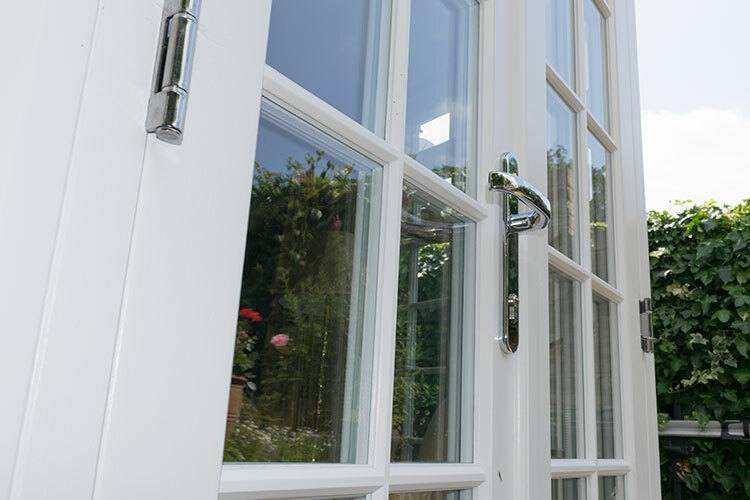 We also invite potential customers to visit the showroom to view the range of timber uPvc and Aluminium products we have on display. 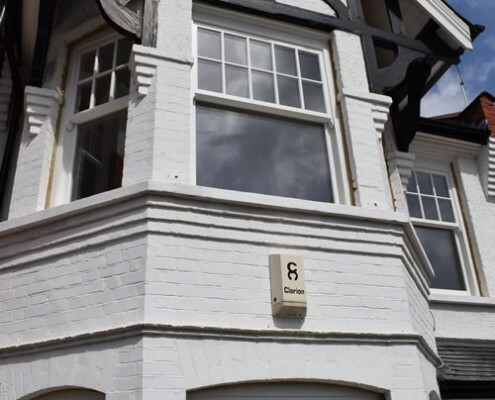 The initial sales call lasts no longer than necessary and in this case the quotation was sent over within forty-eight hours, leaving the client to understand what we were proposing from start to finish. 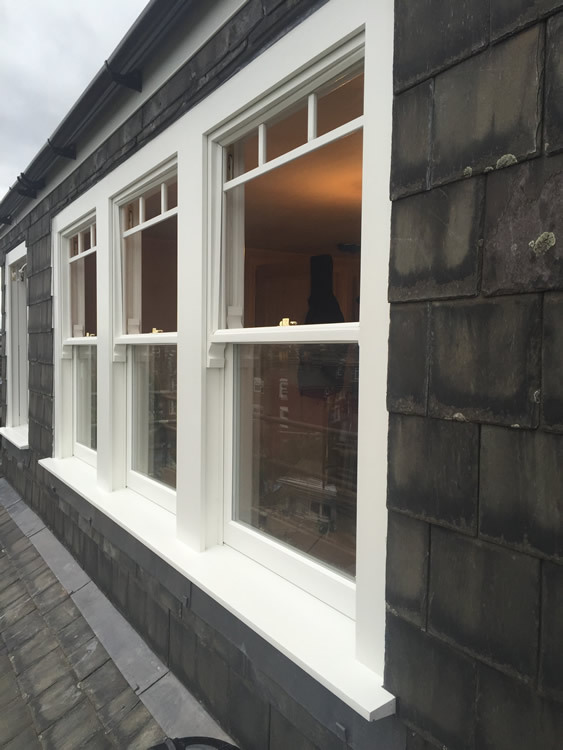 Two weeks later the client visited the showroom and instantly fell in love with the smooth running of the timber sash windows and most importantly the flawless finish of our factory finished timber products. 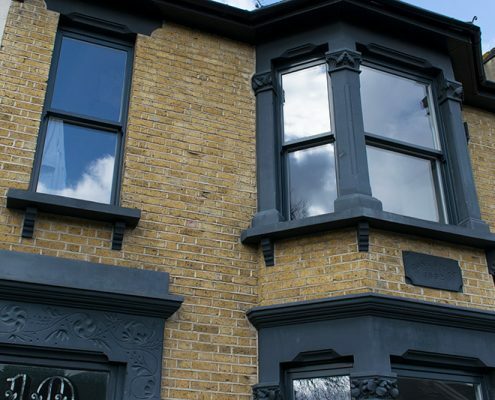 Once the order was agreed a contract was arranged and a 25% deposit was taken and within days a full detailed site survey was carried out and the windows were put into production. 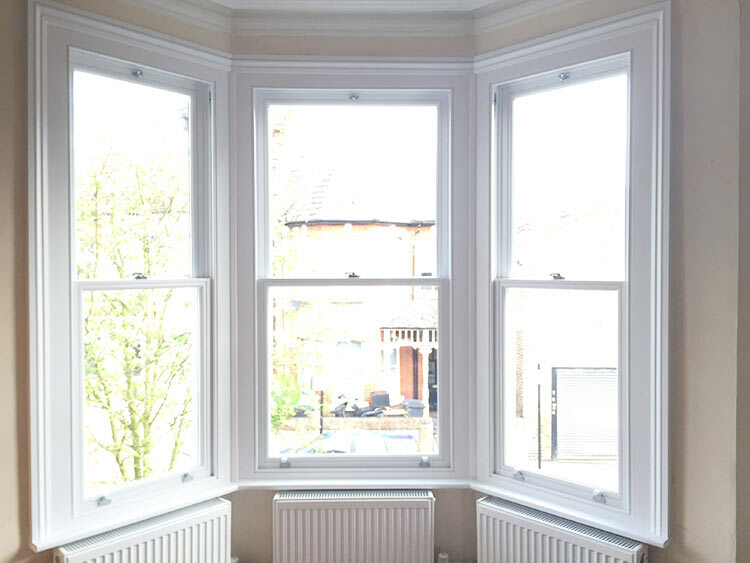 With a six to eight week lead time the installation was scheduled and booked in with the client by our installations team. 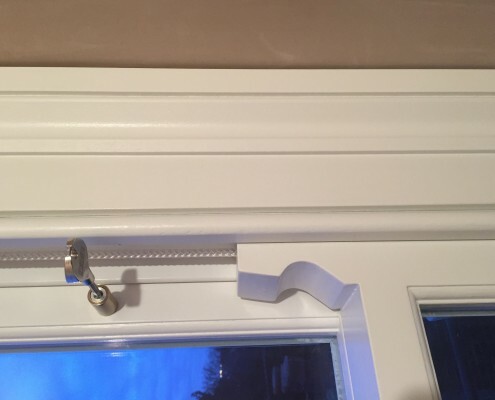 The installation was scheduled for two days. 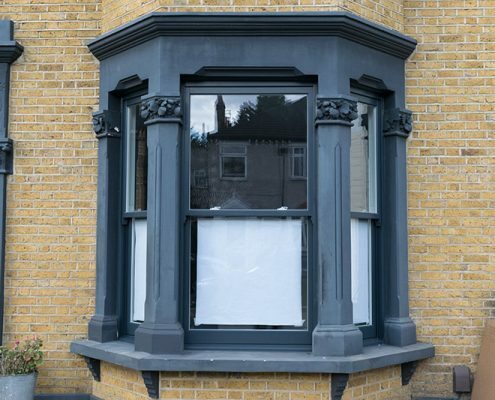 Our installers carefully and meticulously carried out the replacement of the windows using factory finished window boards and architraves internally, and taped off the walls and frames to create new cement fillets to the exterior walls where required. 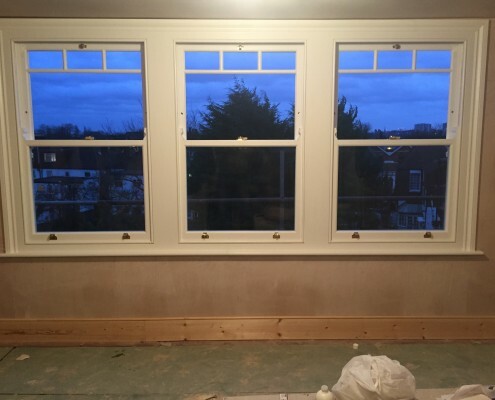 Our client was at work during the majority of the installation which we hope was due to the friendly reassuring service initially provided from the outset. 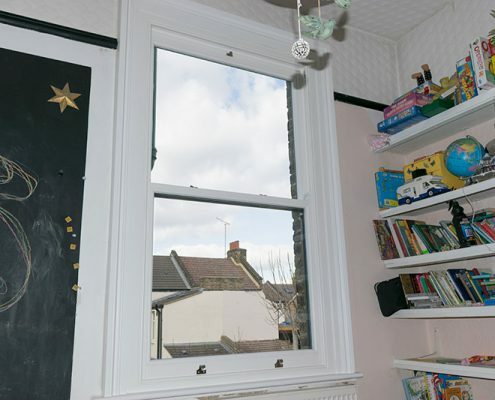 The pictures show a before and after picture. 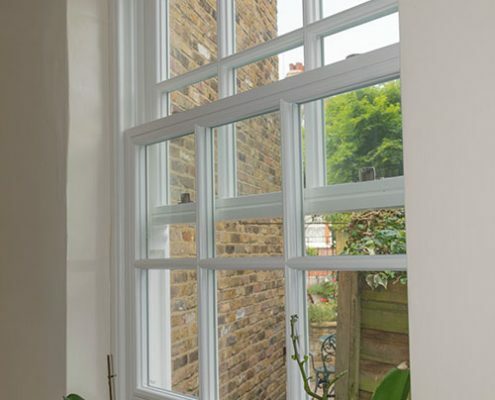 The new windows bring back the full character of the property, not only aesthetically but also adding to the value, lacking with the old uPvc windows. 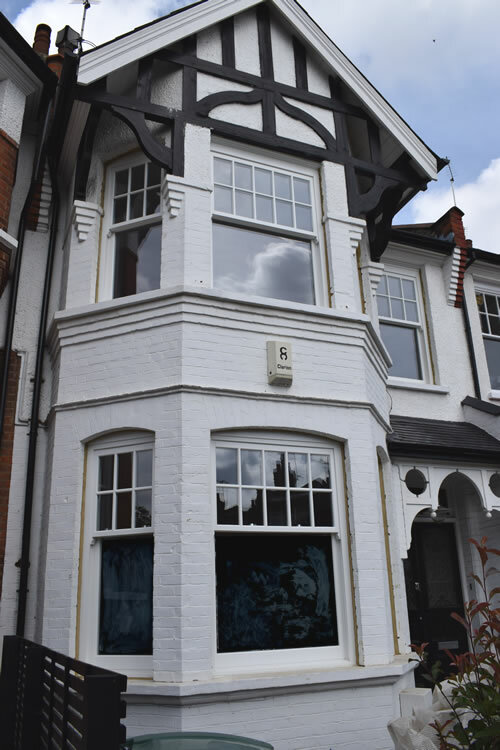 Whilst the installation was carried out we had numerous enquiries from passers-by who could appreciate the massive transformation and quality of the product and workmanship. 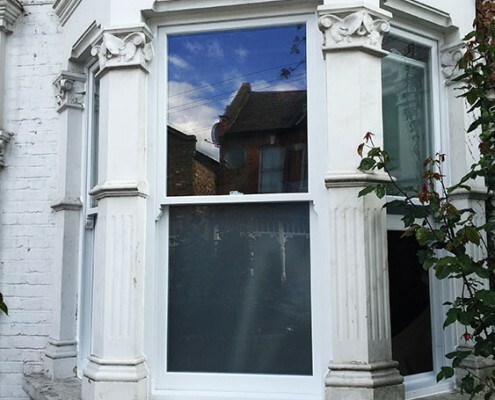 Our most recent timber window installation took place in the leafy Finsbury park area in north London. Our customer contacted Enfield windows after a builder’s recommendation who maintains the property. 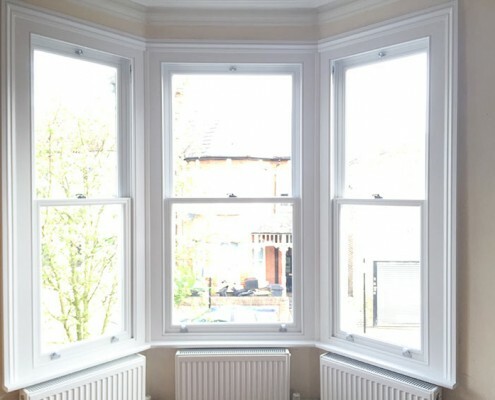 The client currently rents out the flats so he wasn’t able to be present during the sale or installation process. 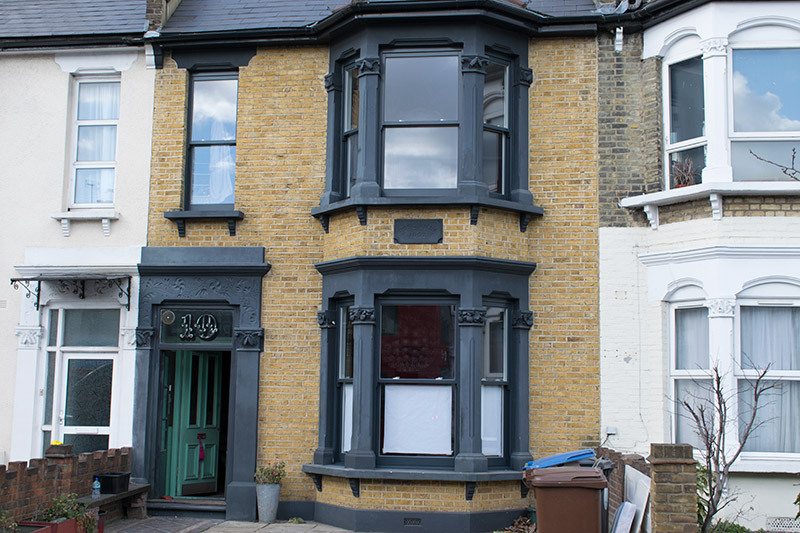 All correspondence was carried out via telephone and email. 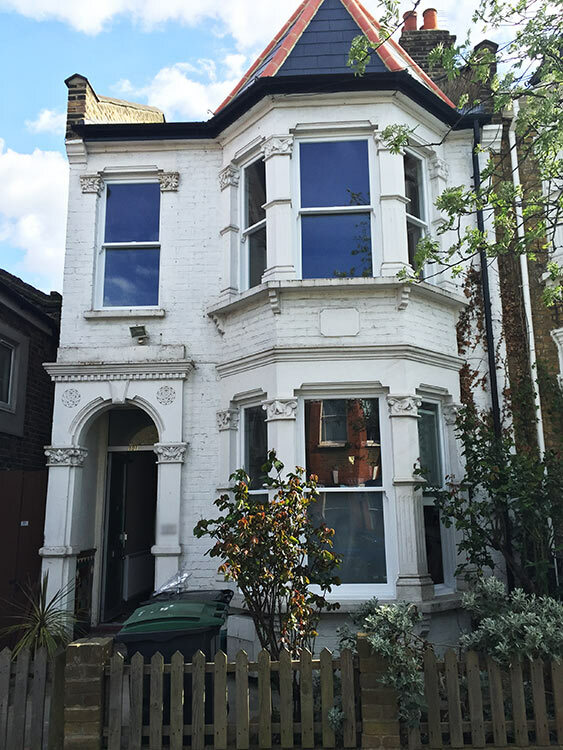 We were handed the keys and invited to visit the property and carry out a full site survey of the windows and doors that needed replacing. 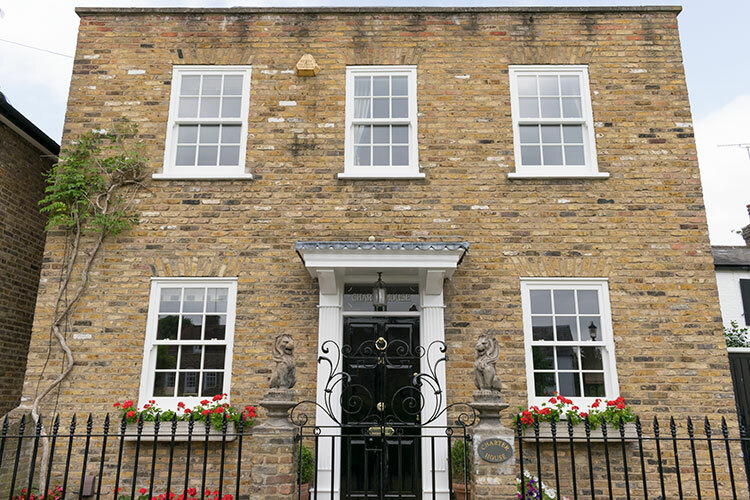 There was a variety of windows and doors that required replacement including timber sash and casement windows and french door sets and single doors. 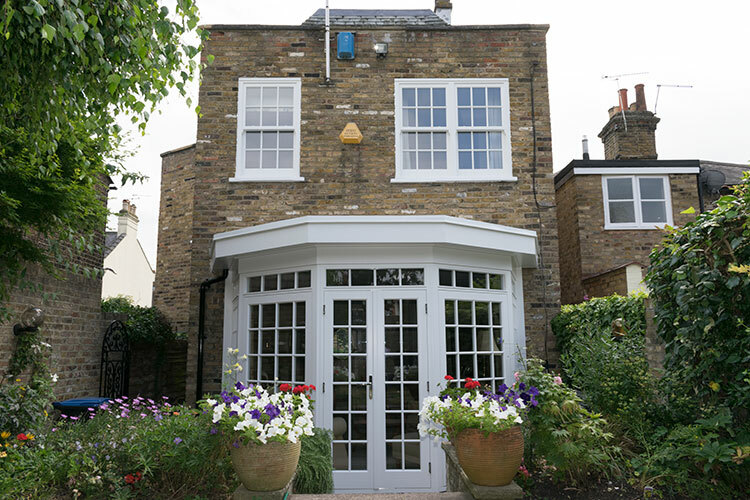 After a proposal was sent and the project cost was agreed, CAD drawings were provided to the client as there were specific arch details and Astragal glazing bar layouts included in some of the frames. 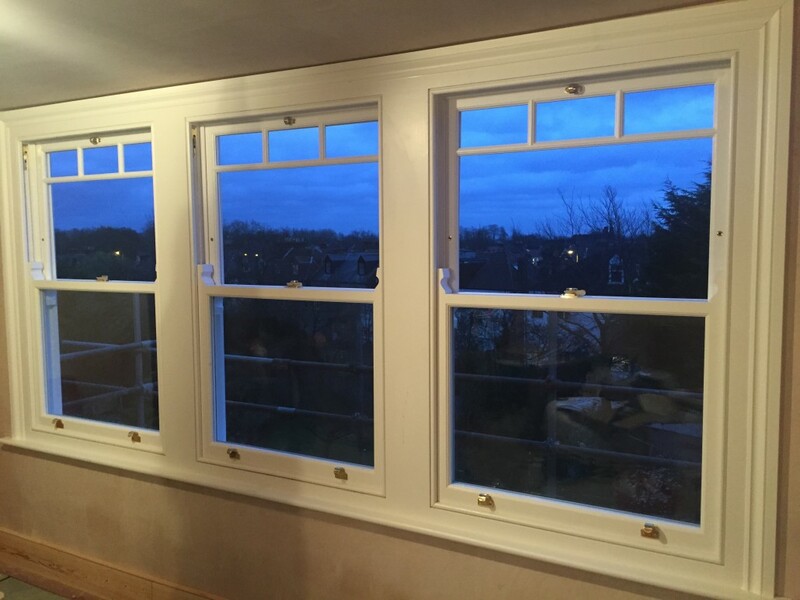 By providing the CAD drawings the client was able to see in detail how the products would look before the order was sent to production. 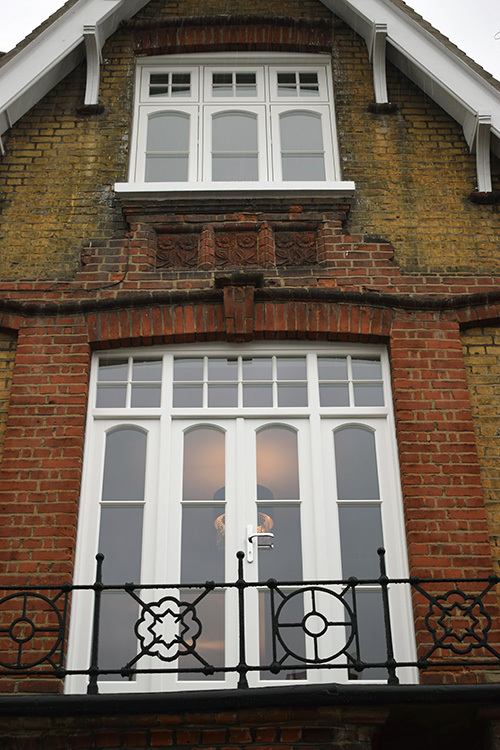 During the six to eight week manufacturing process the installation was scheduled into our diary. 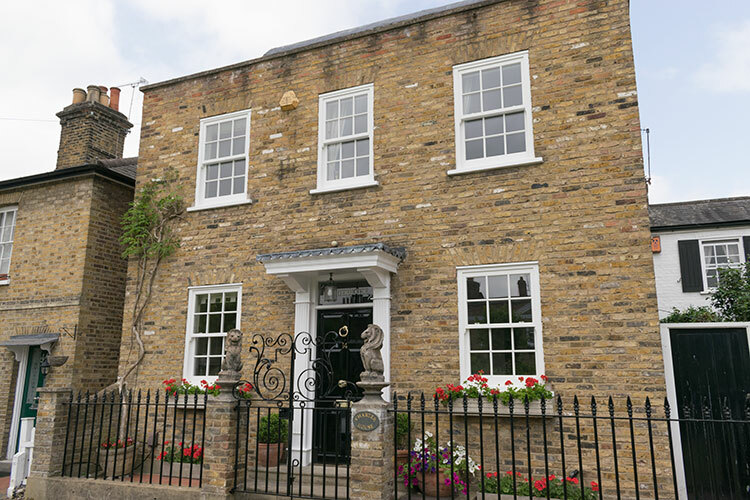 The installation was carried out over a four day period and as the pictures show it is another stunning installation using the very best timber windows within the market. 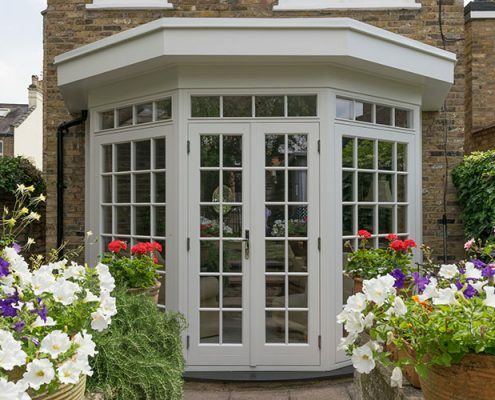 For more information please see some of our other recent blogs and our timber page. 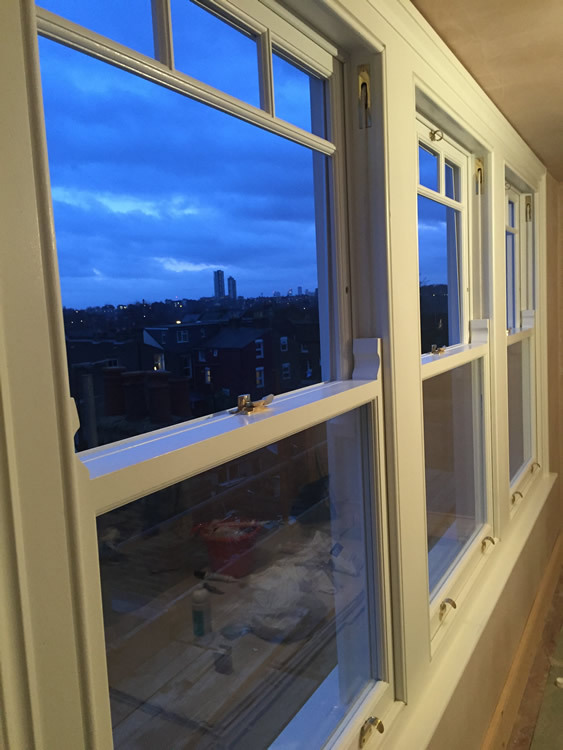 Enfield window most recent timber installation took place in leafy Highgate area of north London. 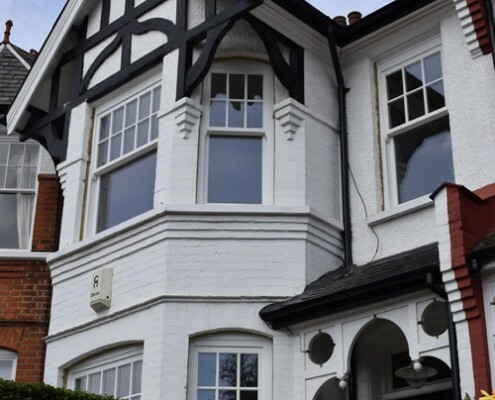 We were recommended to our client by Another Level Lofts who were carrying out her loft conversion. 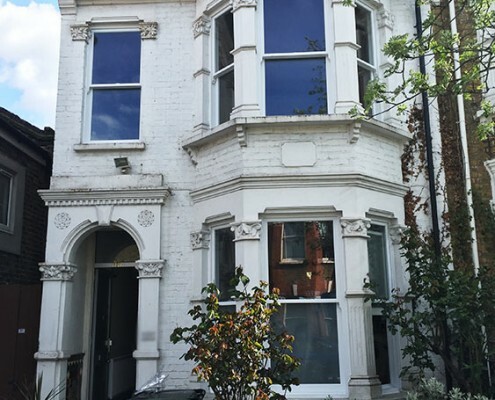 We have previously worked with this high end conversion and refurbishment company on numerous projects in and around the north London area. 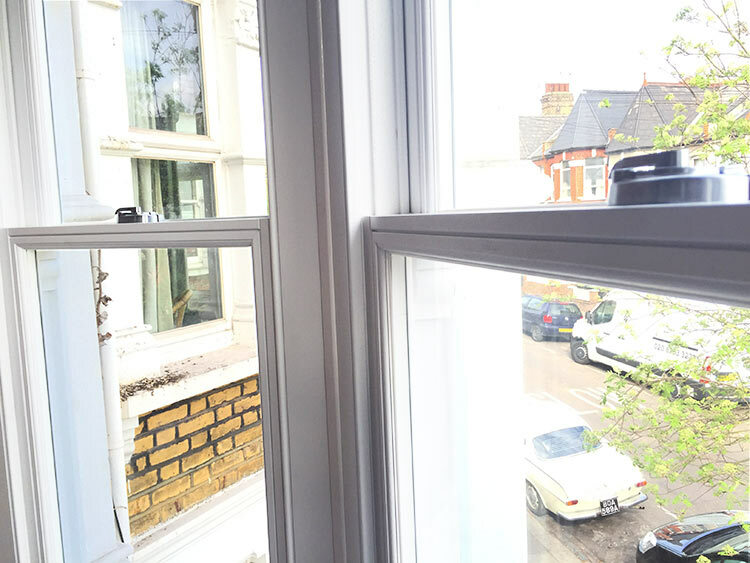 During a visit to our showroom, we discovered the client wanted to have a triple sash window and a single sash window using Timber hardwood as the material. 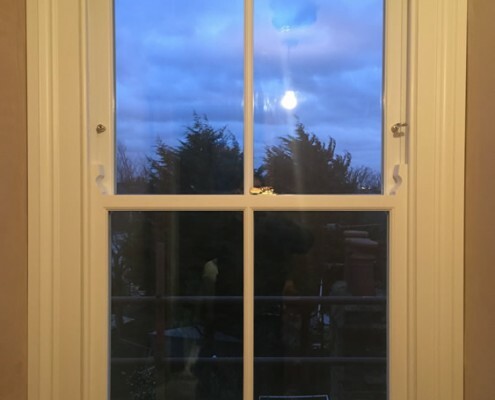 On discussing further options, whether a weighted or spring balanced sash was required and glazing and frame details, a quotation was given based on the drawings. 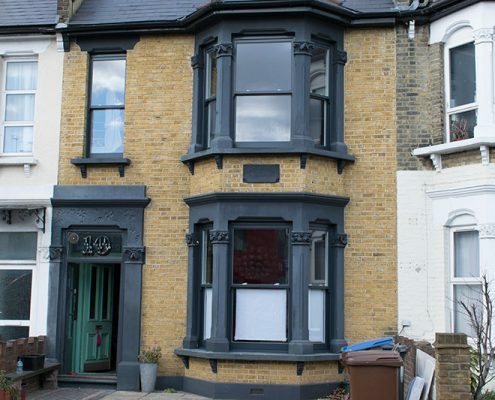 The price was accepted by the client and the finer details were confirmed with a site visit to ensure every aspect was tailored to the clients’ requirements. 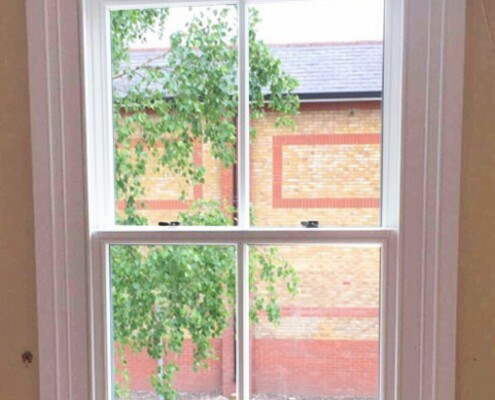 As we have mentioned on our previous installations, all of our timber products are made using the finest quality materials; engineered Hard-Softwood or Oak which is sustained and responsibly sourced timber. 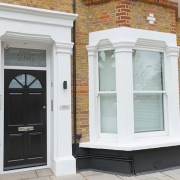 The CNC joinery machines are of the highest specification that allow a number of options. 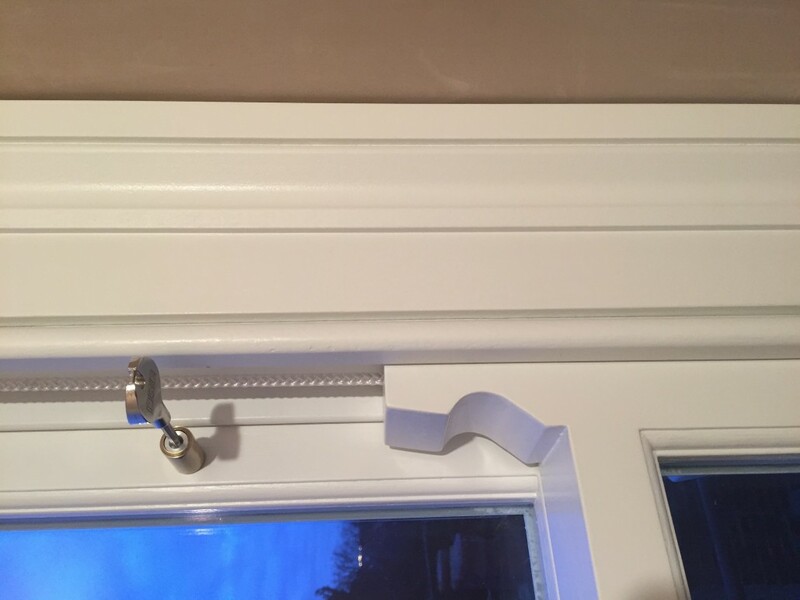 With the tailored specific details we can offer with all our timber products such as the picture above, which shows the internal upstanding horns. Options also include external horns and specifically sized Astragal bars which were also chosen by the client. 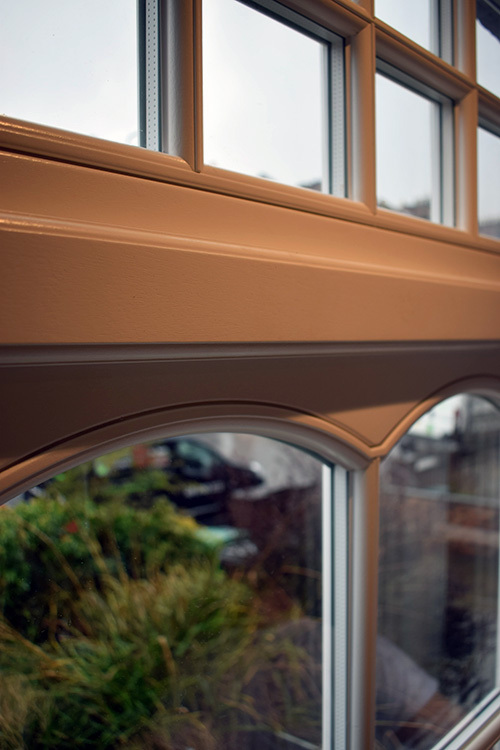 The multilayered factory sprayed finish ensures perfectly even coats every time. 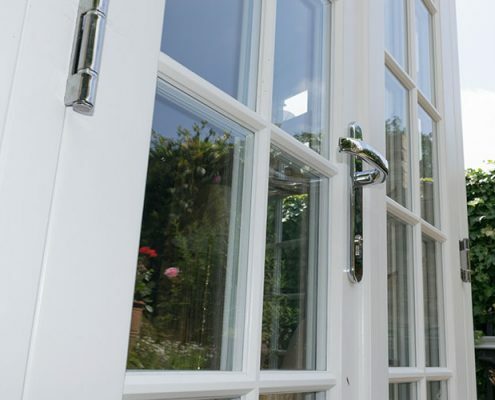 With Argon glass as standard and a huge range of furniture options available, there really isn’t a better timber product on the market. 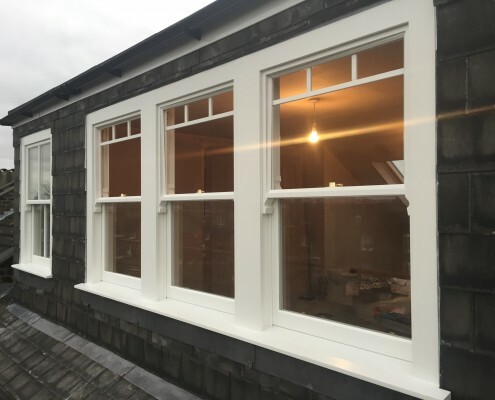 The installation was scheduled and the windows were delivered, with our highly skilled craftsman and dedicated installation manager who oversaw and ran the installation. 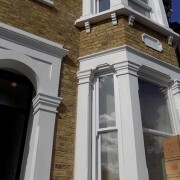 The work was carried out swiftly and the finish was of the very highest standard. 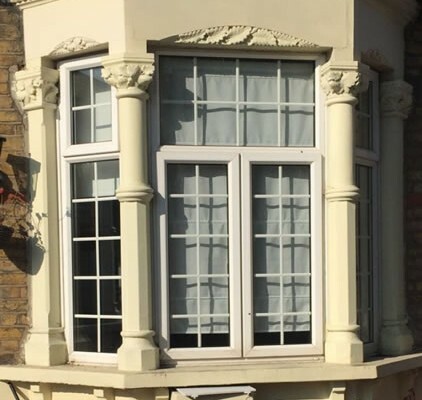 The customer was over the moon with her new windows and now would like Enfield Windows to renew the sashes at the front of the property in the New Year. 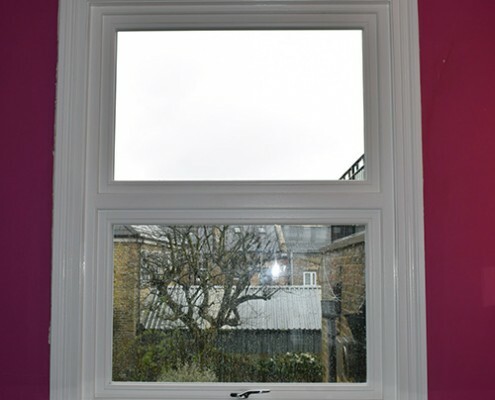 The pictures above show the final finishing including the factory finished Architraves and window boards. 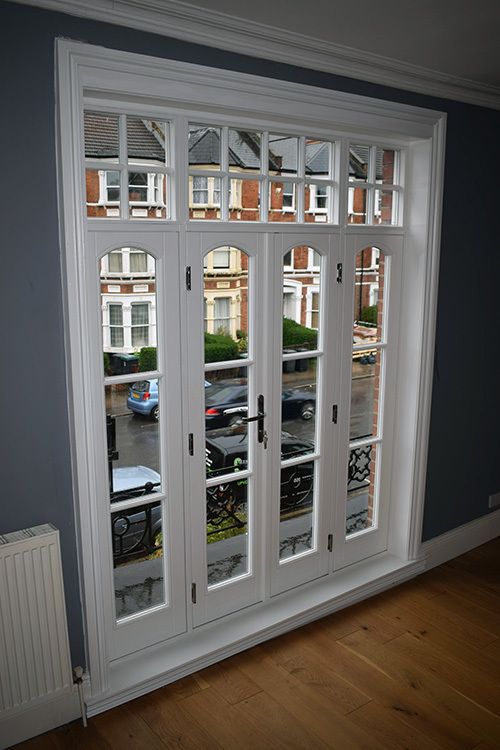 For a no obligation free quotation on any of our products or even if you would like to see any of our installations, feel free to contact us though our web site or the number above. 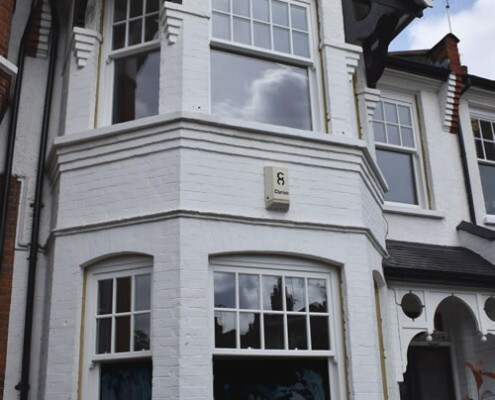 If you would like to contact Another Level Lofts they are here. 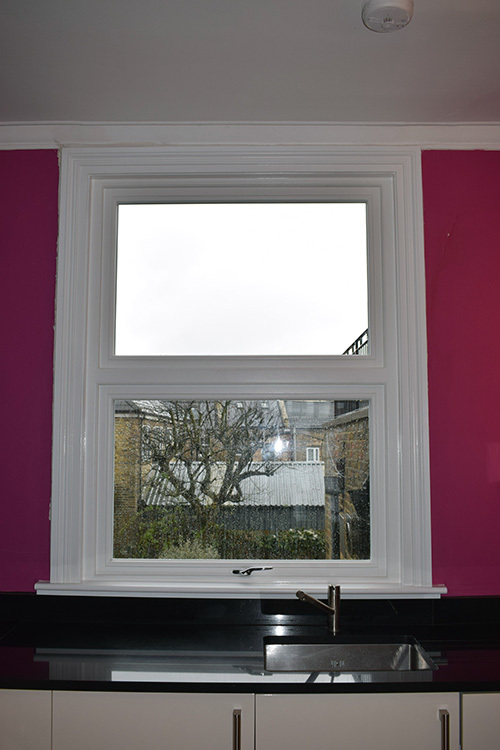 Our latest timber sash replacement window project was in the Harringay area of north London. 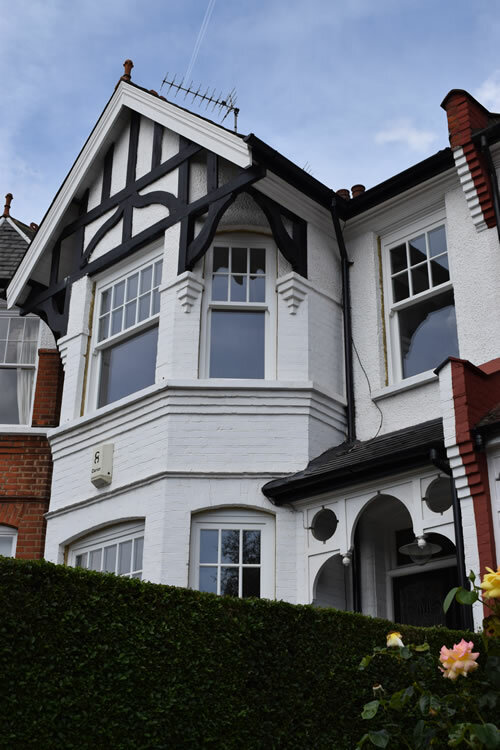 Our client had recently moved to the area and after purchasing the property a new roof, new heating system and replacement windows were a priority. 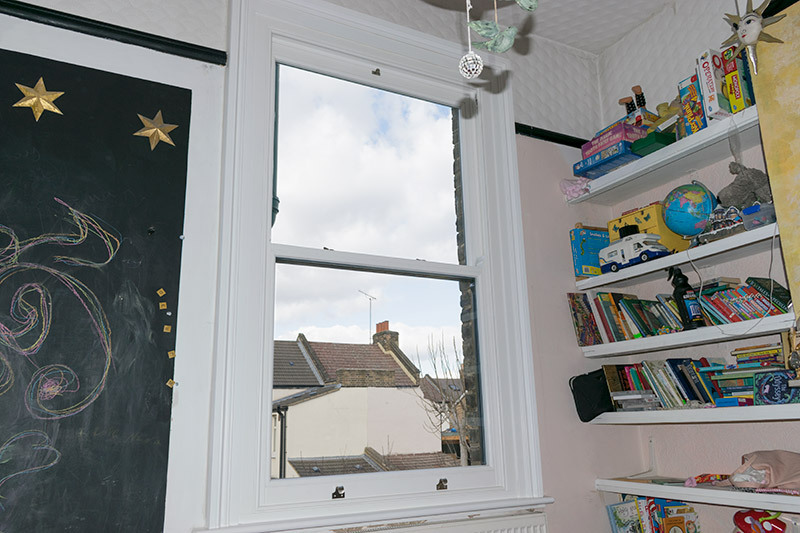 The first point of contact was via our website and a consultation was scheduled by a member of the office to meet and discuss various options for the rear windows. 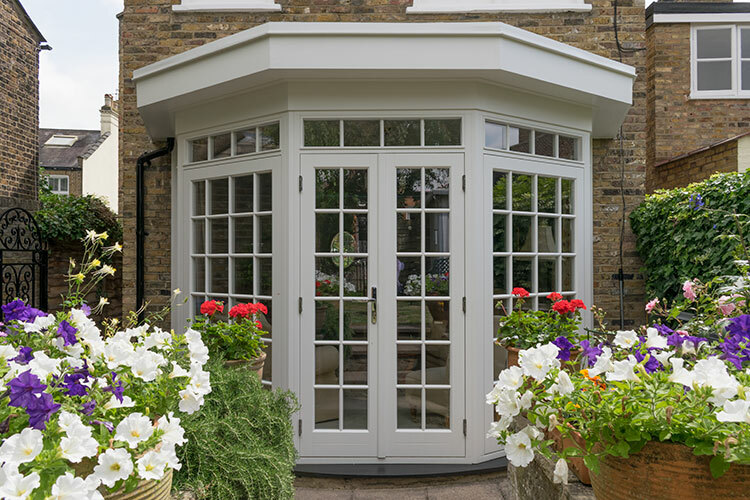 The client also wanted to change her old timber French doors leading into the garden to timber with a panelled detail section at the bottom and an opening fan window above. 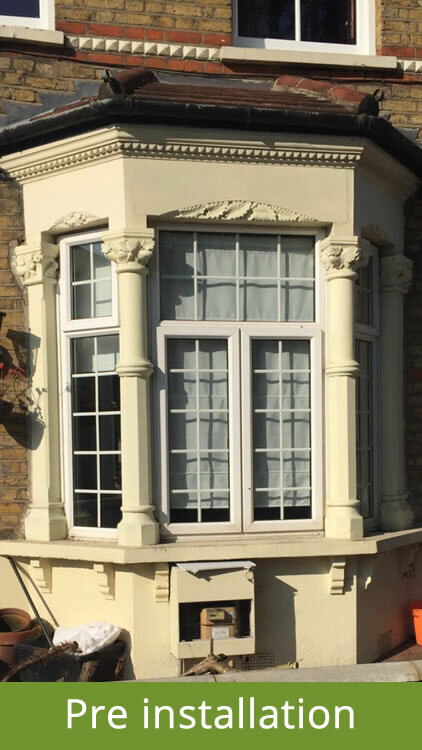 Whilst on the sales visit the client mentioned she was having the front windows replaced in timber with a quotation agreed by a supplier. 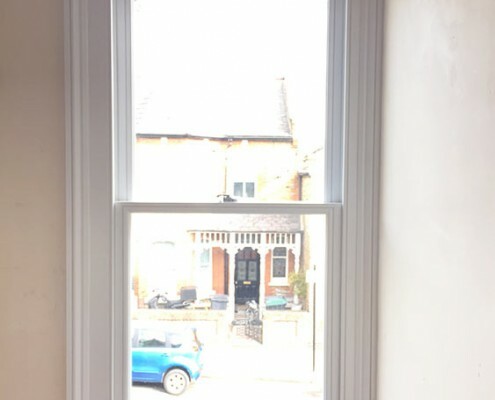 Our sales representative offered to show the client our timber brochure and pictures from some of our recent timber installations with a view to offering a no obligation quote to try and better the original price she had received. 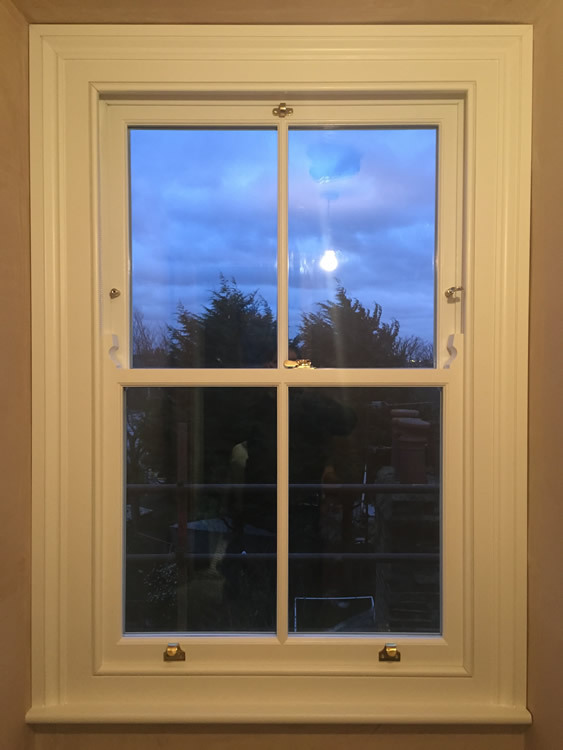 With the dimensions and specifics taken now for the both the front and rear windows our sales representative went away to accurately cost the windows required. 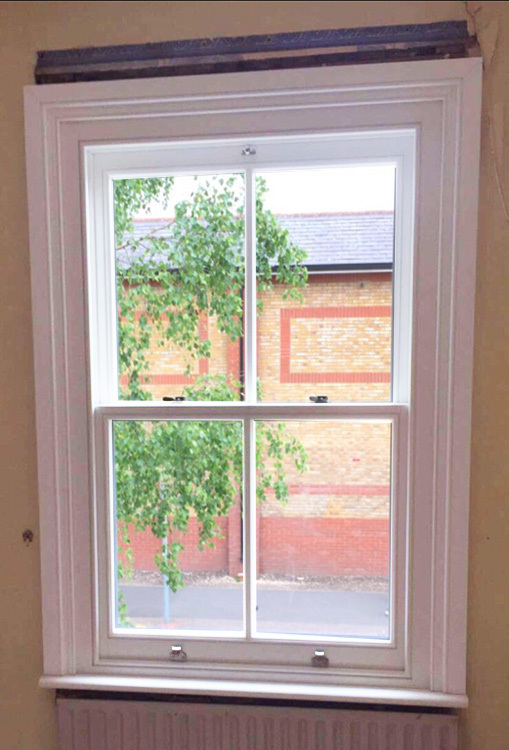 A proposal was sent along with many production photos showing the complete process in which our timber sash windows are constructed and painted. 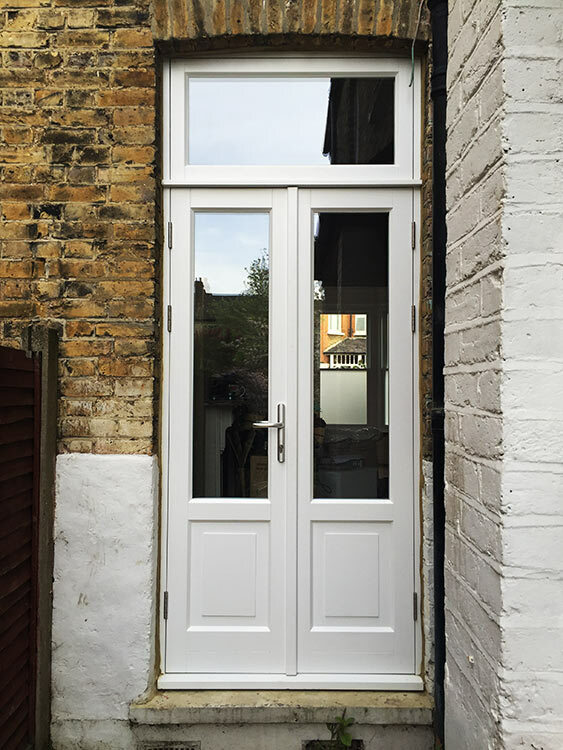 As a result, Enfield Windows were able to save the client over a thousand pounds INCLUDING the three additional rear windows and the French door in the price! 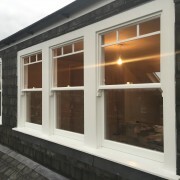 A further visit to the showroom was arranged where the client requested to view the windows she would be purchasing for the front aspect of the property. 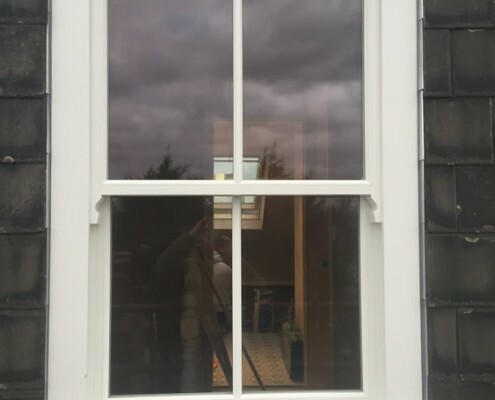 Once the order was confirmed the survey was scheduled to take the final and accurate dimensions for manufacturing. 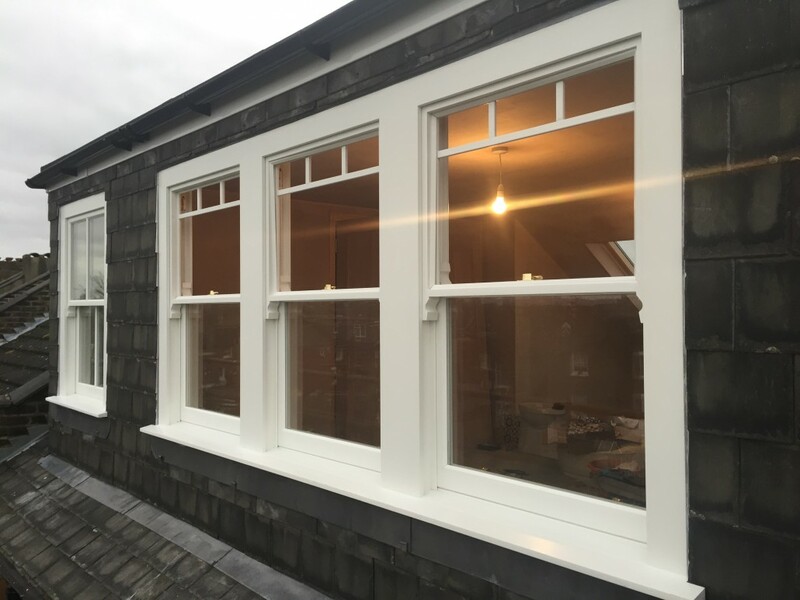 With only a six week lead time an installation date was agreed and the all the windows were installed over a five day period. 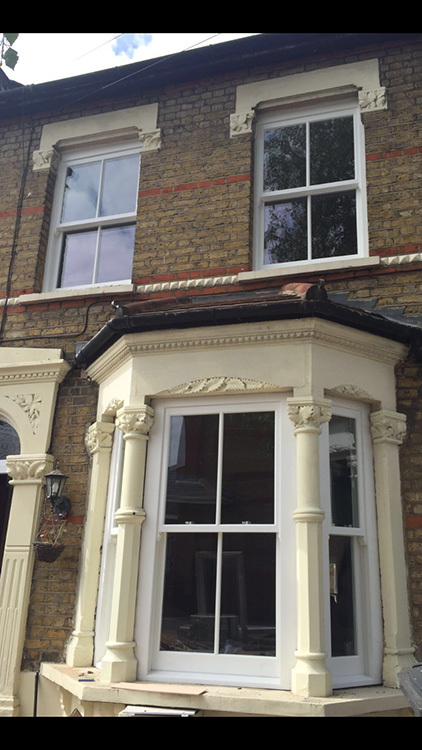 We are happy to say that the client was thrilled with her new windows and the service provided by Enfield Windows.